As I get older, I like snow less and less! As a rancher, snow just means lots of work! This week the weatherman predicted a foot of snow for our area with more to the north and west of us--that is a LOT of snow! We are in a drought, so moisture in any form is welcome, but I have about 50 cows supposed to have their calves this weekend, so I'm really not excited about dealing with a foot of snow at this time! At 3:00 am when we drove out to check for newborn calves, there was no sign of snow. All was calm, the cows were snuggled comfortably with into the straw we had spread for bedding. Those cows that had calves were lying close, enjoying the quiet night. and it was predicted to keep coming down for a few more hours! So we worked hard to find approximately 50 calves and hustle them into a barn to keep them warm and dry. They looked like little snowmen! The calves spent the rest of the day in the barn, with their mamas outside bawling for them. But they were warm and safe. Once the snow stopped and the storm passed, we turned them out and spent some time making sure each of them found their mama and was able to get a meal right away! Once the storm passed, we rolled out fresh straw for all the cows that were having calves. If a calf is born on the snow, he will die quickly as his body temperature will drop fast. 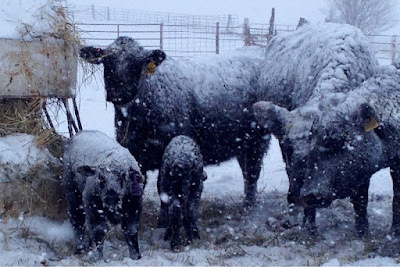 By the time we had caught all the calves, saved a few calves from the snowbank, fed cows, bedded down bull calves and rolled out straw for the cows, we had been working in the deep snow, in stressful conditions for more than 8 hours--and we were exhausted! 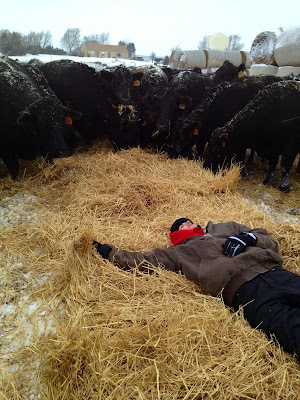 As my daughter finished rolling out a bale of straw, she took a moment to test out the cows' bed! She liked it! I'm not sure the cows appreciated her lying in their bed, but the were curious about her and started to creep closer. Cows are really amazing animals. If they have plenty of feed and water, and a dry place to lie down, they can withstand extremely cold temperatures. The most vulnerable ones are the newborn calves as they are still wet. 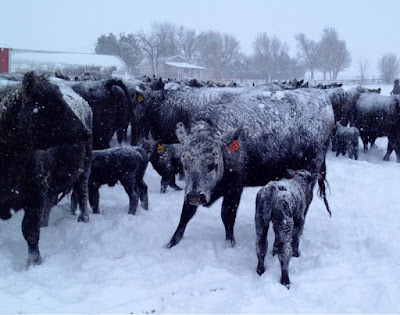 Once dried off, even calves can handle freezing temperatures! As we moved cattle around to warmer locations and bedded them down, I found a bunch of daffodils that had been starting to grow in Grandma's yard. I'm afraid they may be stunted now. 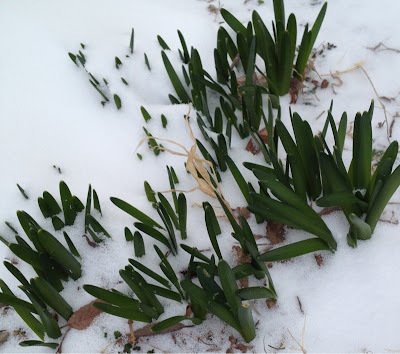 We might skip daffodil season...and move straight to growing grass. Unfortunately, the weatherman has said that this snow is very light and fluffy and doesn't have much moisture in it. He said that 12" of this snow will yield about 0.5" of moisture. That is a lot of work for just a half inch of rain. I think I'd rather have rain! Hope the new babes are doing well! They are awesome! Glad to see them up and kicking! The sunshine today was very good for them. Lovely post. And now we are suppose to have more coming Monday. Maybe this will bring more moisture. Take care. Thanks, Linda. If we have to get snow, at least make it the heavy, wet kind...that brings lots of moisture! The last snow was too dry. A farmer/rancher is never happy about the weather--can you tell? If it is raining, we complain about the mud. If it is dry, we complain about the dust. If it is snowy, we complain about the mess. If it is sunny,....well, I guess it can be too hot! But not for me...I much prefer hot!! Sounds like you are in for a major blizzard. Will pray that you, family, and cattle all make it through the storm okay. Thanks for your prayers. It does help give me strength to get out of bed at 3:00 am to check for new baby calves when I know someone cares! I just finished looking for babies--we have one new one. The heifer has it up and it is nursing, so I crept away without bothering them. It is just spitting rain right now, but as the day goes on we are predicted to get dropping temperatures, high winds and lots of snow. I'd be fine with being on the edge of the storm and just getting rain!! Mud is a good thing on our ranch! We need more of it! Good point about fly season! I know that is one of the difficulties of calving in the fall. There are pros and cons for any calving time. You just have to fit it into your resources. I appreciate the supportive thoughts. I know cattle people are working just as hard as we are to care for their herds. I am proud to know that I am a part of that group of people who will sacrifice their own comfort and safety to take care of their animals. Your encouraging comments mean a lot to me!